In September1954, to mark the centenary of the Victorian Railways, an exhibition of old and new motive power and rolling stock was held at Spencer Street station. 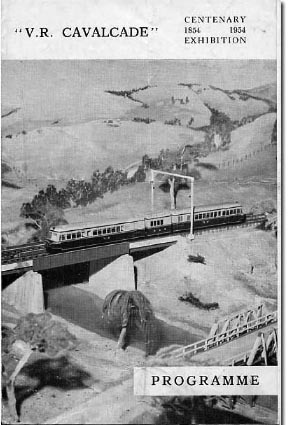 This show was supported by an exhibition of models showing representative trains from a number of periods in the VR's history. The model exhibition was held in the Lower Melbourne Town Hall and the models were built by members of the VMRS. Click on the picture of the programme to continue.